Received My First Pull Request! 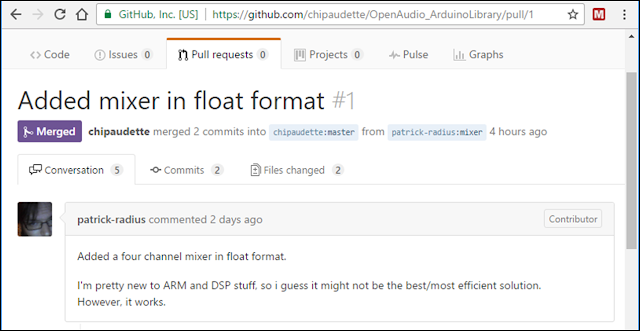 After my post about my floating-point extension of the Teensy Audio Library, I received my first Pull Request! Someone besides me is working on the library, and that is such a complement. Thanks, @patrick-radius! Converting Existing Blocks to F32: For his first contributions, Patrick created AudioMixer4_F32 and AudioMultiply_F32. His approach was to take blocks from the existing Teensy Audio Library (their GitHub is here) and create F32 versions. Since many people are already familiar with the Teensy Audio Library, this is a great approach for quickly adding more floating-point capability to the library (and to your own project!). Full-scale for the floating-point algorithms is +/-1.0 instead of +/-32768. So, if you are copying algorithms from the Teensy Audio Library, you don't need to include scale factors or gain limits with values such as 32768 or 255 or 127. In your *.h file, include a comment block at the top that identifies the name of the class and you as the creator. For an example of such a header, see AudioEffectGain_F32.h. Once your class works, be sure to put an #include for your *,.h file into the library's overall header file: OpenAudio_ArduinoLibrary.h. Also, add your class as a keyword in keywords.txt. Example Sketch: When contributing audio blocks, consider making an example sketch so that I (and others) can see how it works. Your example sketch should go in the examples directory of this library. Stereo to Mono Example: Patrick did not include an example sketch with his contributions, so I made one. I made an example using his My example, MixStereoToMono_Float, uses his new AudioMixer4_F32 class to take a two-channel (ie, stereo) input and mix them into a single-channel (ie, mono) output. By including such an example, a new person can see how to use your new audio processing block. Testing Using Audacity: To test my example sketch, I used Audacity to generate some test audio and to send the audio to my Teensy 3.6 via the Teeny's USB audio connection. For my test audio, I created an upward sweeping chirp for the left channel and I created a steady 2 kHz tone for the right channel. In the screenshot below, the yellow arrows point to the panning controls that I used to force my audio into the left and right channels. Result: Hitting the record button, Audacity played the stereo audio out to the Teensy while simultaneously recording the audio being output by the Teensy. 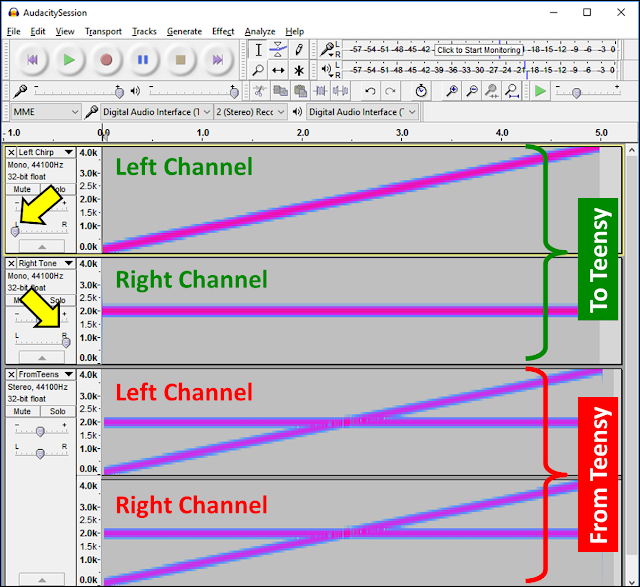 As you can see, the audio produced by the Teensy was the mixture of the left and right inputs. Success! Many Thanks: I'm so appreciative for Patrick's high-quality contributions to this library. Many, many thanks. And, from him or from anyone elese, I greatly look forward to additional Pull Requests!